Imagine certainly fits my ideal vacation rental. It’s right on the beach, still has privacy, and has modern interiors. There’s a private chef and a housekeeper so no one has to lift a finger, and ocean views from every room. Plus, tons of high-tech amenities that fit all the comforts of home. If this sounds like a dream to you too, then Imagine is the perfect villa for your next Barbados getaway. Imagine Villa is a three-story beachfront villa on Barbados’ West Coast. This four-bedroom property guarantees luxury thanks to its private chef and stylish interiors. Batts Rock Beach is just beyond the villa’s saltwater mirror pool. 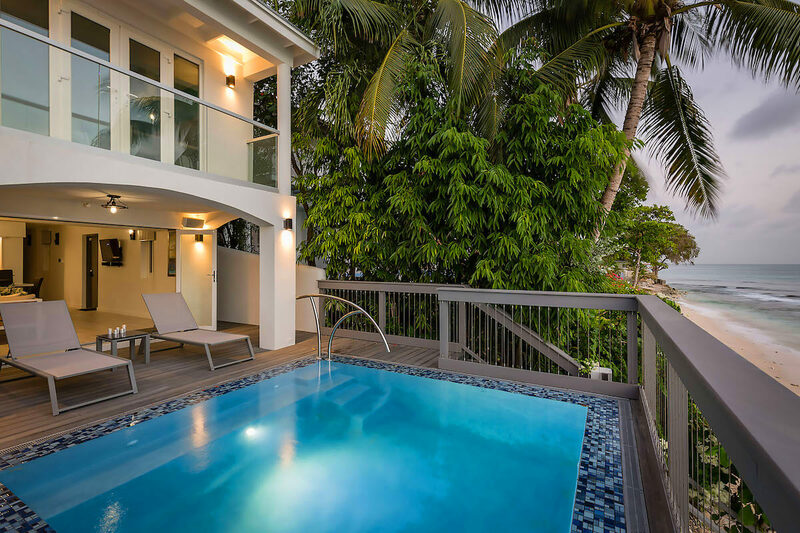 The terrace has direct beach access down a short flight of stairs, and palm trees on either side add privacy from the neighbors. There’s loungers on the deck, and sliding glass doors lead into the living room. The living room has chic decor and the adjacent dining table seats 6. A breakfast bar sits between the dining area and the kitchen, which is fully equipped with stainless steel appliances, a farmhouse sink, and sleek cabinetry. The villa features a washer and dryer, a multi-room audio system, over 1000 TV channels, Chromecast, top-notch security, and atmospheric lighting zones. The spacious penthouse suite has tons of natural light, vaulted ceilings, and glass doors that lead to a private rooftop terrace. The terrace has panoramic sea views and is the perfect place to sunbathe or enjoy a cocktail with friends. The villa also has two king suites and one twin suite. One of the king suites has a glass balcony overlooking the Caribbean Sea. All four bedrooms have a private bathroom with a rain shower, air-conditioning, and a flatscreen TV. Imagine Villa is situated near world-class waterfront restaurants, duty-free shopping, and beautiful beaches. The villa is staffed with a housekeeper and round-the-clock concierge. Upon arrival guests will secure their rental car and drive to the villa using the directions provided. Car rental, butler, server, grocery and beverage shopping (pre-arrival and during your stay), liquor and wine delivery, nanny service, baby equipment, spa services, yoga and personal training, photography, and private airport transfer/car service can be arranged for an additional fee.